The Indoor Environmental Quality (IEQ) category addresses concerns relating to occupant health, safety and comfort; energy consumption; air change effectiveness and air contaminant management. IEQ strategies include issues relating to Indoor Air Quality (IAQ) such as the supply of filtered outside air, ventilation effectiveness and the control of contaminants including the protection of heating, ventilation and air conditioning (HVAC) systems during construction and flushing the building before occupancy. In addition, issues relating to day lighting, thermal comfort and occupant control of building systems as well as access to views all have the potential to enhance indoor environmental quality and promote occupant health and productivity. Indoor Air Quality (IAQ) performance results in improved occupant comfort, well being and productivity. Superior IAQ is fostered by using high quality outdoor air and providing adequate ventilation rates. While this may result in greater energy costs, personnel costs are a significant percentage of operating costs (greater than energy or maintenance costs) and thus strategies that improve employee attendance and performance are encouraged. Siting: Fresh air intakes were designed to be away from sources of contamination. Supply Air Capacity: The ventilation system meets the requirements of the reference standard. Pollutant Source Control: potentially harmful contaminants from occupant activities such as smoking were restricted and contaminants from building materials was minimized by specifying low volatile organic compound (VOC) products. IAQ performance results in improved occupant comfort, wellbeing and productivity. A strong link between smoking and various health risks has been well documented. The most effective way to avoid the deleterious health effects associated with smoking is to ban smoking indoors. Pollutant Source Control: Potentially harmful contaminants from occupant activities such as smoking were restricted and contaminants from building materials was minimized by specifying low VOC products. High indoor carbon dioxide (CO2) levels are generally an indication of poor indoor air quality. Lowering concentrations of CO2 by introducing outside air is one strategy for optimizing indoor air quality. CO2 sensors make it easy to adjust the amount of outside air required based on the number of occupants so that levels stay below 400 ppm which is well below the American Society of Heating, Refrigerating and Air-Conditioning Engineers (ASHRAE) 62 recommended levels. 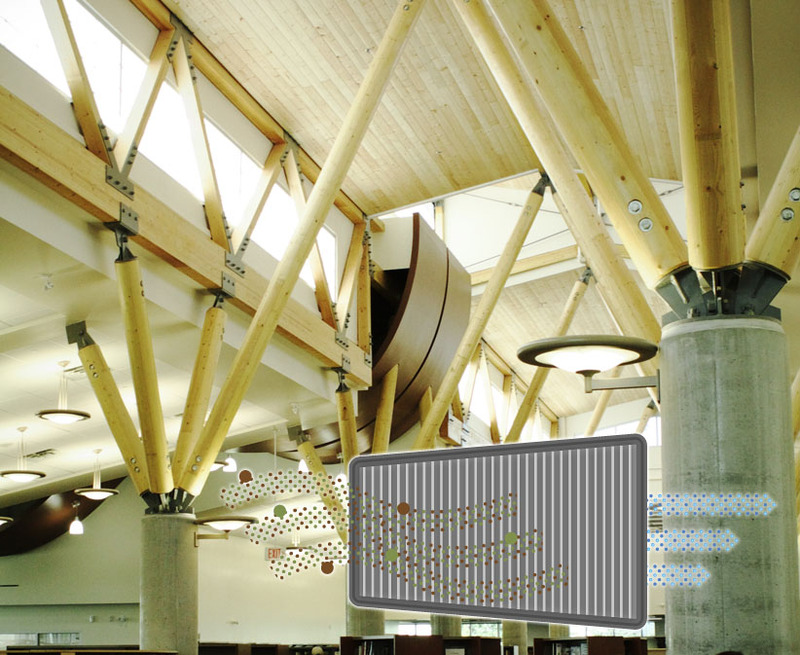 CO2 sensors installed: One sensor is located at the main return air grille of the atrium while a second sensor is located in the Reading Amphitheater. Indoor environments are known to have many chemical and biological pollutants, many of which are known to have significant health impacts such as asthma. Increasing the building's ventilation above the minimum standards improves indoor air quality (IAQ) which benefits the health and well-being of occupants. The Lois Hole library building has achieved a greater air change effectiveness in each of the occupied areas as determined by governing standard ASHRAE 129-1997. Construction processes by their nature can contaminate the building with HVAC systems being especially prone to contamination with particulate matter. This poor indoor air quality can affect construction workers and often results in residual building contamination that may adversely affect occupant health for years. Construction management practices during construction and before occupancy can minimize contamination. Building flush out or testing and HVAC protection are effective ways to mitigate the IAQ impacts of construction. IAQ Plan, Construction: The five control measures of the referenced Sheet Metal and Air Conditioning Contractors' National Association (SMACNA) standard, namely HVAC protection, source control, pathway interruption, housekeeping and scheduling were employed to minimize indoor air quality problems. IAQ Plan, Occupancy: A minimum 2 week flush out was conducted to remove contaminants related to construction activities including those from product and material selections. Building products often contain compounds that have a negative impact on the indoor environment and on the earth's atmosphere. Volatile Organic Compounds (VOCs) are the most prominent of these and have been shown to contribute to air pollution and the generation of smog as well as affecting the well-being of occupants in a negative way. VOCs react with the sun and other compounds to form ground level ozone, a major component of smog. Ground level ozone reduces lung function by damaging lung tissue and sensitizing the lung to other irritants. Low Emitting Materials: Choose materials in the categories of Adhesives and Sealants (IEQ c 4.1), Paints and Coatings (IEQ c 4.2), Flooring and Systems (IEQ c 4.3) and Composite Wood and Agrifibre Products that meet the minimum limits as established by the indoor air quality reference standards. An environmentally sound building supports occupant well-being which may contribute to lower healthcare costs. With proper maintenance, harmful airborne chemicals (such as those from certain maintenance products) and particles (such as those carried in on shoes) can be controlled. Permanent Entryway systems (floor grates): Entryway systems that reduce the amount of contaminants tracked into occupied spaces have been installed in all high traffic exterior to interior access points. Janitorial Storage Area: In order to contain the potential for airborne contamination from chemicals, the janitorial storage area is located away from occupant work areas and has been completely separated in a self-contained room equipped with an exhaust fan. The design of building systems that maintain an acceptable level of thermal comfort for occupants is essential in all regularly occupied spaces. Productivity can be reduced and the time and energy to complete tasks can be increased in spaces that are not comfortable. This can lead to equipment and spaces being used longer than necessary, resulting in an increase in energy use over the long term. Lois Hole Library's building systems comply with ASHRAE Standard 55-1992 for thermal comfort standards including humidity control within established ranges per climate zone. Increased daylighting reduces the need for electric lighting, which reduces energy-related environmental impacts such as resource depletion and air pollution due to energy production and consumption. Increasing evidence shows that increased daylighting as well as views to the outside are important factors in human satisfaction, productivity and health. Computer simulation model confirms lighting levels: A computer simulation model was used to confirm the required minimum Daylight Factor of 2% or the achievement of at least 250 lux (25 footcandles) of all regularly occupied spaces.